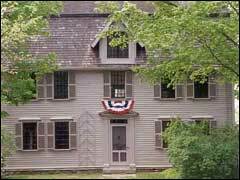 In the summer of 1842 when Hawthorne first moved to The Old Manse with his bride, he did not do any writing. In the fall, however, he returned to magazine writing, publishing tales and sketches in the Democratic Review and "Little Daffydowndilly" in the Boys' and Girls' Magazine. In 1845 a second edition of Twice-told Tales was published, and in that same year Journal of an African Cruise appeared, a travel book by Horatio Bridge that was edited by Hawthorne. Mosses from an Old Manse was first published as a two volume set in 1846; it includes many of the short stories and essays written by Hawthorne in the second floor study of The Old Manse. Excerpts related to The Old Manse from The American Notebooks by Nathaniel Hawthorne, edited by Sophia Hawthorne, 1868, Boston: Houghton, Mifflin, 1883 (volume IX of the 13-volume Riverside Edition of the Complete Works of Nathaniel Hawthorne). Full text of "Little Daffydowndilly"